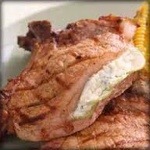 Prep Day: Cut a horizontal slit through thickest portion of each pork chop to form a pocket. Stuff 2 tablespoons crumbled blue cheese into each pocket. Freeze in a single layer in freezer bag. Serve Day: Thaw. Sprinkle 1/4 teaspoon salt and 1/4 teaspoon pepper evenly over both sides of pork. Heat a large nonstick skillet over medium-high heat. Add olive oil to pan; swirl to coat. Add pork to pan; sauté for 3 minutes on each side or until desired degree of doneness. Remove pork from pan, and let stand for 5 minutes.